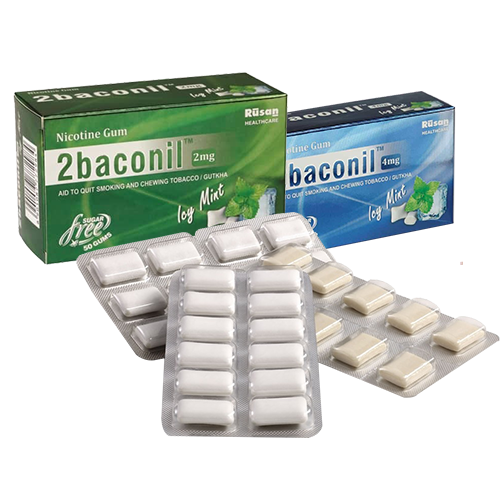 2baconil® Nicotine Gum is a form of Nicotine Replacement Therapy which is used in Tobacco Cessation (Stop Smoking Programs). The 2baconil® nicotine gum, helps controlling the withdrawal symptoms / cravings for smoking, chewing gutka and other tobacco products. The gum assists in gradually bringing down the addiction over a period of time. How does 2baconil® Gum works? The psychological implication, is where one is habituated to a habit and has certain triggers associated with it. For eg: On waking up, drinking tea/coffee, post lunch, while drinking alcohol, etc. Thus, for successful quitting, one has to overcome these triggers by making their will power strong and being positive about quitting the habit. This attitude will help you overcome the triggers which you associate with smoking/chewing gutka.